GEN1REV22: YOUNGER WORLD , EVIDENCE FOR : WHERE ARE ALL THE STONE AGE SKELETONS ? YOUNGER WORLD , EVIDENCE FOR : WHERE ARE ALL THE STONE AGE SKELETONS ? WHERE ARE ALL THE STONE AGE SKELETONS ? Homo Sapiens ( wise and rational man / Human beings ) , according to evolutionary anthropologists , inhabited our planet for some 185,000 years before the advent of agriculture . 1 The human population for this time period of some 185,000 years was at an average constant , between one and ten million . Obviously the dead had to be buried , some may have been cremated or buried at sea or even vapourised by some long lost weapon of mass destruction , and this included being buried with artifacts etc . The above scenario would have resulted in approximately eight billion bodies having been buried .2 BUT where are the bodies ? 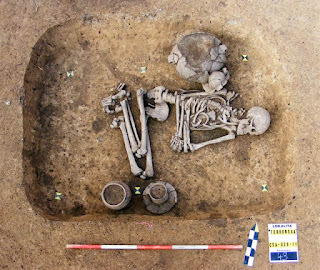 If eight billion stone age buriels took place then we should expect the ground to be full of stone age skeletons and their artifacts ( evolutionary timelines would allow bones to last much longer than 200,000 years in the ground , especially the buried artifacts ) . But only a few thousand have been found . This surely implies a much shorter stone age than has been applied by evolutionary theory . The evidence is pointing to a stone age of only a few hundred years . 1 . McDougall, I., F. H. Brown, and J. G. Fleagle, Stratigraphic placement and age of modern humans from Kibish, Ethiopia, Nature 433(7027):733-736 (17 February 2005). THE TRUTH OF THE BATTLE . ORIGIN of Life .......Boiled broth . The Crucifixion | A Medical Perspective .